Grab more gadgets and Enjoy them with Sun Group Plan 999 loaded with Unlimited Sun Calls & Texts 750 texts to other networks. Hurry Up! 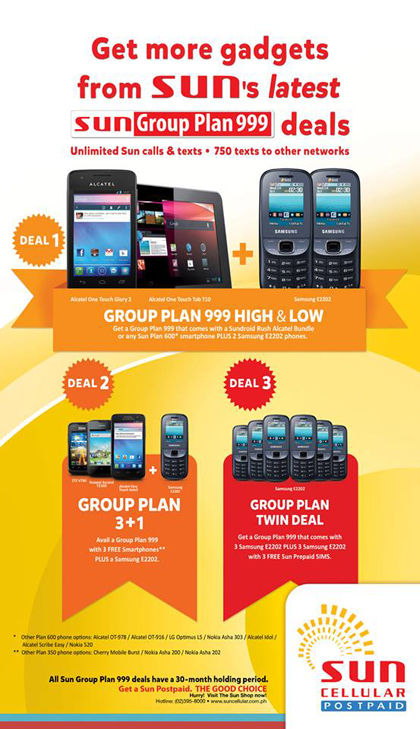 Choose from SUN Group Plan 999 great deals listed below. Apply Now! Click HERE for the complete list of requirements, or visit Sun Cellular Facebook page or website www.suncellular.com.ph for more details and latest updates.